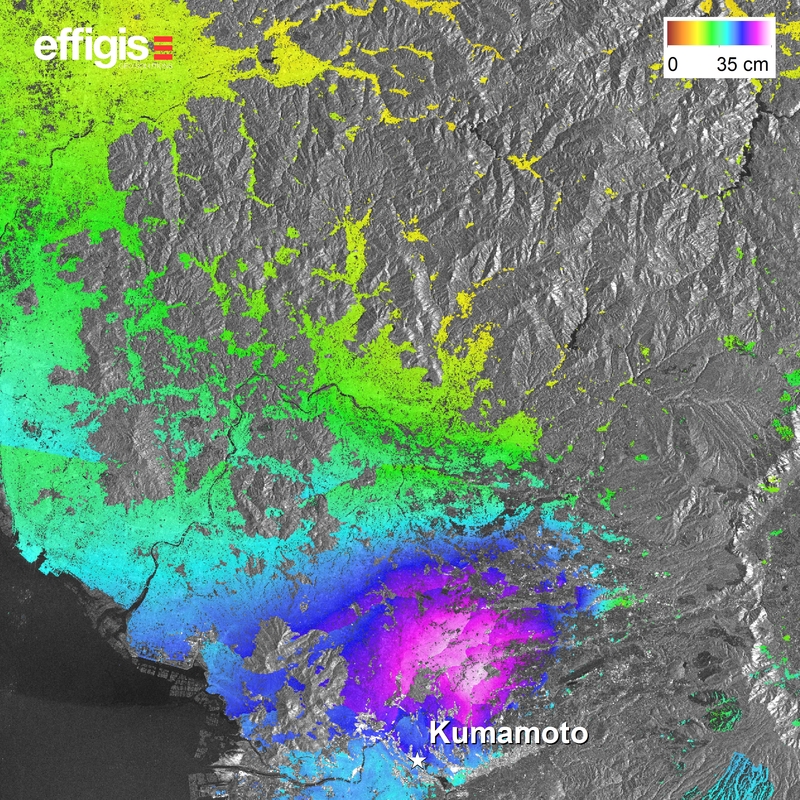 On April 14, the city of Kumamoto, on the Japanese Island of Kyūshū, was hit by a violent and massive earthquake with a magnitude of 6.5, followed by a series of aftershocks, including one with a powerful magnitude of 7.1 during the night of April 16. This catastrophe resulted in about 60 deaths, a thousand injured and damage to many infrastructures and houses. Nearly 100,000 people were evacuated from their homes. 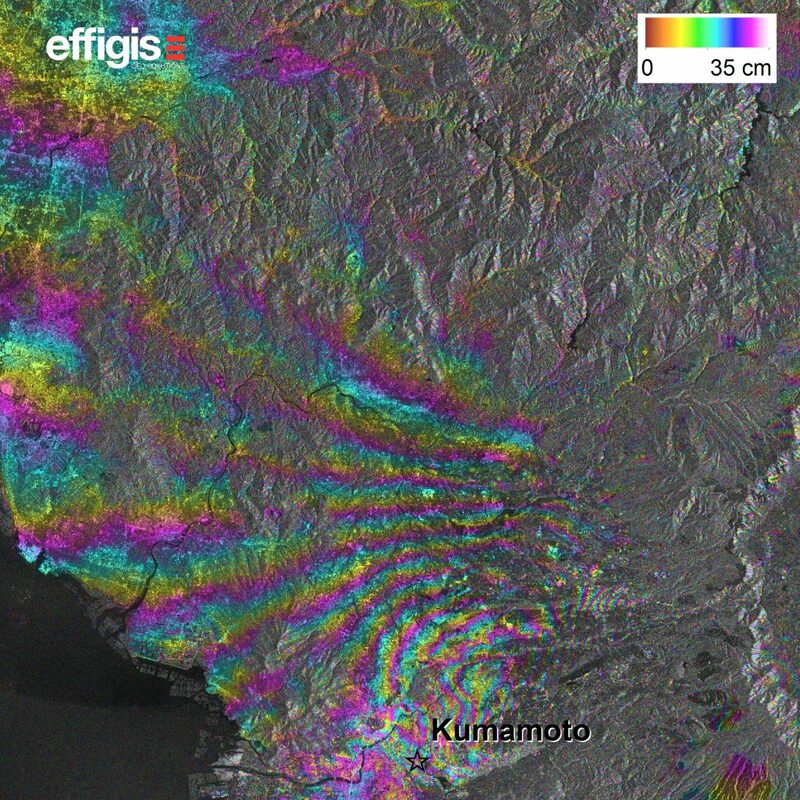 Using two SENTINEL-1A (European Space Agency) radar images acquired on March 27 and April 20, 2016, and differential interferometry (DInSAR), the Effigis Earth Observation team measured the ground displacement that took place following this earthquake. 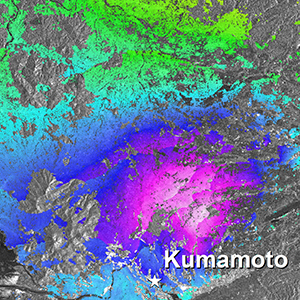 The figure to the left shows the differential interferogram created from the two SENTINEL-1A images (using VV polarization). The interferometric fringes represent displacements of 2.8 cm between each colour cycle. The figure to the right illustrates these vertical displacements, which extend beyond 30 cm from the epicentre. Radar interferometry is a solution used to detect with centrimetric and millimetric precision very small deformations in the ground and displacement of structures.